This house is an oasis within a dense new suburban neighbourhood. A quiet, private and earthbound structure which seeks sunlight, captures views and embraces its landscape. It is an exploration in form, volumes and the structural, textural and aging qualities of its materials. The design evolved as a series of enclosures stepping down the site, negotiating and retaining existing trees and creating private, sunny, sheltered courtyards and roof decks. These spaces have been mirrored around a top-lit, stepping circulation spine. This configuration allowed for maximum light and cross ventilation, the creation of formal relationships between openable indoor and outdoor living spaces, and the opportunity for an expressive building geometry incorporating double height spaces. Materials have been judiciously chosen from a restricted palette. Etched masonry was selected for its permanence, solidity, quietness, thermal performance and textural qualities. It also offered the opportunity for fluidity between internal and external materials, its massiveness contrasted by refined soldier coursing and jointing details. Lightweight timber cladding was selected as a counterpoint to the masonry. Large areas of timber cladding have been finely milled into slender boards accentuating verticality while elegantly aging. "Annie & Peter’s House was the first of several houses that now occupy the former ‘Boot Forest’, a contentious subdivision on Churchill Avenue. The original land was owned and planted out in the early 1980s by Dr John Boot, with European elm, oak and silver birch and the reserve was of some significance to the local community. The remaining trees are now semi-mature. The architects, mindful of the proximity of future neighbours and faced with a steep, narrow site conceived a strategy of solid, private volumes stepping down the contour, coupled with a singular circulation spine. 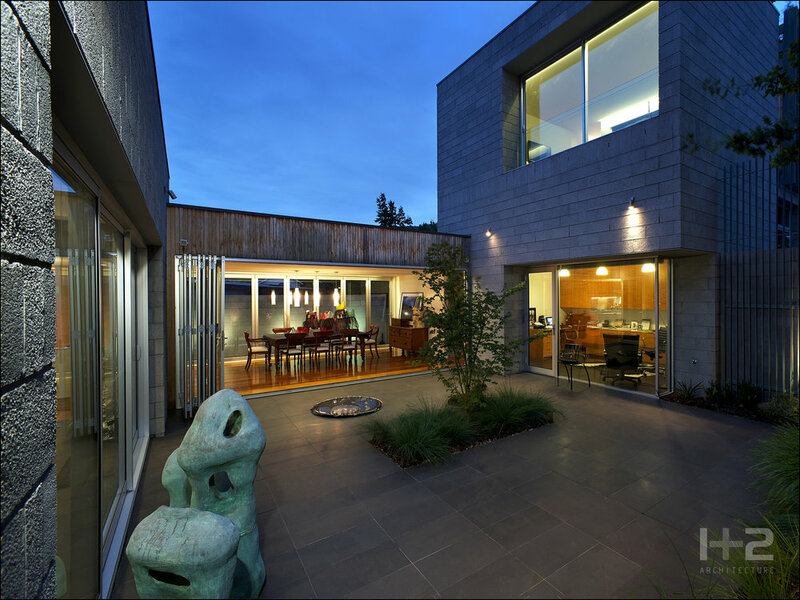 This approach provided for protected, sun-filled courtyard spaces to extend the living spaces and connect to the landscaped periphery. The resulting geometry is an elegant progression of forms, buffered from Churchill Avenue by a landscaped entry zone containing some of the original deciduous trees. Attention to masonry detail and contrasting exterior celery cladding articulate the building’s mass. Interiors are simple and comfortable, with the circulation zone and staircase given drama via a top-lit opening, uplifting the experience of moving through the home’s various levels. The owner-builder requirement in the brief demanded that the architects protect the design through largely ‘irreducible’ construction detailing and this projective method, combined with a faithful approach by the client, has contributed significantly to the project’s success."